We are a dental practice located in Macon, GA that is devoted to restoring and enhancing the natural beauty of your smile using conservative procedures that will result in beautiful, long lasting smiles! We make sure you are treated like you would at a day spa with comfortable amenities that make you feel good about being at the dentist. Our standard of excellence in personalized dental care enables us to provide the dental services our patients deserve. We provide comprehensive treatment planning and use restorative and cosmetic dentistry to achieve your optimal dental health. Drs. Mann and Zinney along with their team are committed to giving you the finest in patient care and to ensuring you have a comfortable, secure and memorable visit. Let Providence Dental Spa help you get the look that you deserve! 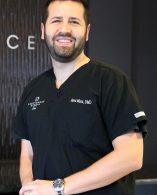 Dr. Mann received his Associates degree from Gordon College in 2000, Bachelors degree from the University of Georgia in 2002 and Doctorate degree from the Medical College of Georgia in 2007. He completed the “Maxi Implant Comprehensive Training” in 2009 followed by “MCG IV Sedation Comprehensive Training” in 2010. Dr. Mann has completed mission work for underserved people in Ecuador in 2004, Peru in 2005 and Mexico in 2006. Dr. Mann focuses on cosmetic and implant dentistry. He understands that the appearance of your teeth is important and knows there are a variety of ways to maintain great oral care and a fresh image. No matter what procedure or treatment you are considering, Dr. Mann will explore the options to help you further enhance your facial appearance. Cosmetics are the leading trend in health care today. Patients have many questions about what is possible. With all the advancements in dentistry, patients can expect natural tooth colored restorations, veneers and crowns that will last for years to come. You no longer have to live with gaps, missing teeth, stains or silver fillings. Even the most subtle difference in tooth size, shape, texture and color can be part of your overall look. Dr. Mann can help you achieve a look you can be proud of.